Creating a canvas “Pierrot and Harlequin”, Paul Cézanne created the story, which is dedicated to the celebration of Mardi Gras. This is the last day of the Maslenitsa festivities on the eve of the fast. But in the picture itself there is not even a hint of Shrovetide carnival or fair. Here we see only two young people dressed in carnival costumes. It can be seen, they have just stepped on the stage, waiting for the festive ceremony. The figures and facial expressions depicted on the canvas more closely resemble the images of puppets. Around them, the artist depicted the appropriate environment. This is a stage, and a gorgeous curtain, and bright-colored outfits. 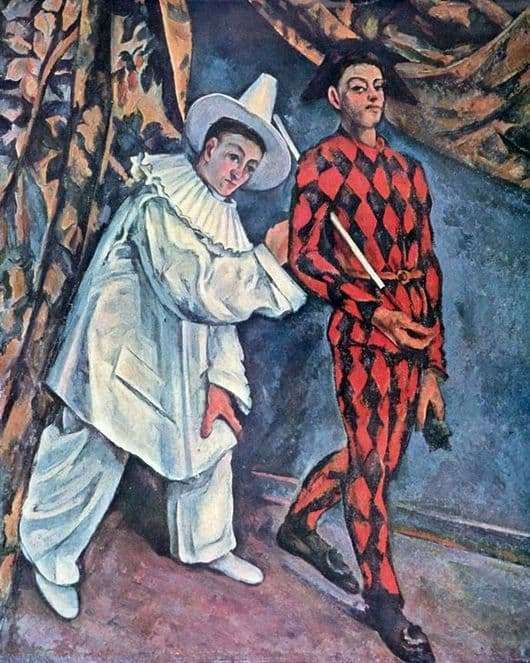 In his work “Pierrot and Harlequin”, Cezanne deviates greatly from his usual style of drawing. The master of the brush always avoided thoroughness in depicting small elements, but here he very vividly depicted all the details of the costumes of theatrical heroes, in particular collars and buckles on shoes. In addition, he gave the expressiveness of the characters acting. Cezanne paints adds to the resourceful and cheerful Harlequin of arrogance and cynicism, and to the shy Pierrot insincerity and secrecy. It seems that the dreamy Piero is thinking about something of his own, but if you look closely, you can see how he surreptitiously wants to push Harlequin. The artist himself paid much attention to his creation. The canvas turned out quite colorful, as the painter uses a wide range of colors. Take, for example, the bright outfit of Arlekino, which highlights the hero’s figure against the general background and draws the viewer’s eye with painted black and red diamonds. By the way, they perfectly reflect the character’s sharp character. Working on the creases of the costume Pierrot, the master used the gray-green shades, showing himself as an excellent draftsman.